While a relatively quick 28-move draw might not sound thrilling, the first-round encounter between Magnus Carlsen and Levon Aronian at the Tata Steel tournament was actually razor-sharp until the final moments. Sergey Shipov was on hand to explain what took place. UPDATE: You can now also play through the game with Shipov’s commentary in English using this game viewer: http://www.chessintranslation.com/tata-steel-2011/ I’ll try to do the same with all the games, though as it’s very time-consuming it might be something I usually leave to the rest days! Hello, dear friends! 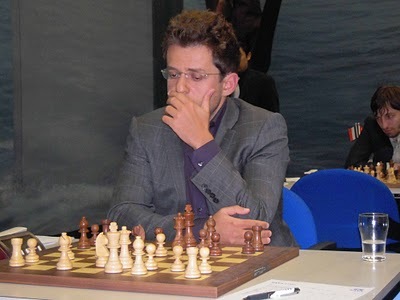 This is Grandmaster Sergey Shipov, an expert from the site www.crestbook.com, starting my series of reports from the super-tournament in the Dutch Wijk-aan-Zee. As usual, a public vote on the KC forum determines the most interesting game of the day – and I’ll commentate on it live. (Translator’s note: today’s voting took place here, but you need to be registered and logged in to see the result – and it’s all in Russian). The tournament line-up is very interesting. On the one hand, there are the titans of chess, while on the other – young fighters. All that’s stopping it being ideal is the absence of Topalov and Karjakin, but don’t ask who they should replace. There just aren’t enough slices of the tournament pie to go around… I’d like to pay particular attention to the performance of the newly-crowned Russian Champion, Ian Nepomniachtchi. I’ve trained him, and we’re still in touch – so I’m not going to manage to hide my relationship with him behind the mask of commentator’s impartiality. I’m rooting for Ian! I’d also like to note the appearance in elite company of the extremely pleasant Anish Giri. He’s also… well, let’s say he’s not foreign to us. And although the young man’s now playing for Holland we’ll also take genuine pleasure in his new successes – though it’ll be extremely tough to achieve them. There are clear favourites in Wijk-aan-Zee – Anand, Kramnik, Aronian and Carlsen. Everyone’s betting on those four, and I’m no exception. I’ll just add that a fifth person is bound to intervene in their struggle. His name, however, is still a secret for everyone… So then, the first round is about to begin. Let’s watch the battle of the favourites. 1. e4 And they’re off! 1…e5 2. Nf3 Nc6 Aronian’s opening preferences are as stable as a mountain range. He’s ready to spend all his life playing the Ruy Lopez. 3. d4 But Carlsen’s decided to avoid the mountain range. The Scotch has again become extremely popular – precisely because of the rare solidity of the Ruy Lopez. 3…exd4 4. Nxd4 Nf6 The Kopayev Variation. 5. Nxc6 bxc6 6. e5 Qe7 7. Qe2 Nd5 8. c4 The main line. 8…Ba6 Black is ahead of White in development, but his pawn structure has chronic flaws, and in many lines the bishop on a6 is left out of play. 9…g6 The best means of employing the f8-bishop. The e5-pawn is creaking, but holding. Black needs to choose his moment to attack it with a pawn. 11…Nb4 Threatening a fork on c2. 12. 0-0-0 An interesting pawn sacrifice – for development. It’s a novelty! 12…Nxa2+ Judging by the speed of his reaction, the new move came as no surprise to Aronian. The home preparation of both players went along the same lines. 13. Kb1 Nb4 The two tempos haven’t been wasted. 14. Ne4 But White has managed to “grab” the f6 and d6 points. That creates an excellent foundation for an attack. Magnus is continuing to play his home preparation quickly. White’s ready to embed a saboteur on f6. There’s also the h2-h4-h5 raid, which would allow the rook on h1 to enter the attack. Levon has sunk into serious thought – and rightly so. 15…Rfe8 A logical manoeuvre – the rook moves to a file that’s just about to be opened once and for all. 16…Bxf6 17. exf6 The contrast in time expenditure is becoming noticeable: 1:44 – 1:13. On the one hand Black wants to send his queen into the attack – to c5. But on the other hand, it’s terrifying to leave your king in such solitude. What if White suddenly manages to break through to g7 via h6 with his queen? In that respect it looks safer to retreat to f8. In general, White’s king cover can be broken open without the use of the strongest piece, which for now can remain in seclusion. 17…Qc5 Boldly and energetically played! Aronian decided not to “sure things up”. Playing on a collision course is, of course, more interesting. 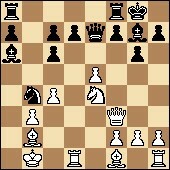 Black’s queen is capable of paying a visit to the white king, via a5. The d7-pawn, of course, is poisoned: one check on e1, the next on f5, and the game’s in the bag. 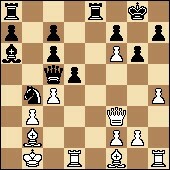 18. h4 The Norwegian doesn’t want to concede the initiative to his opponent. A very strong refutation. 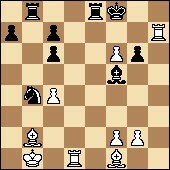 Black blows open the centre, making use of the currently superior activity of his pieces. By the way, after 18. Qf4! the 18…d5 blow wasn’t so strong – in that case White would exchange queens on f8, after which his king wouldn’t be under threat, and the bishops would gain in strength i.e. it turns out that the impetuous 18. h4 advance was inaccurate. However, it’s still not too late to send the queen off on the f3-f4-h6 path and, if possible, to g7. But 19. h5 isn’t so strong because of 19…g5! As Carlsen looks into the position in depth his time advantage is slipping away: 1:17 – 1:03. 19. Qf4 Yes, the most solid move. White should equalise! 19…dxc4 A logical continuation of what he started. The rags covering the white king are falling to pieces. 20…Rab8 Not, it seems, the most critical continuation, although it appears entirely logical. The cannon is taking fire at the white king. 21. Qh6 There’s nothing else. The white king couldn’t survive with queens on the board. Black maintains the initiative. For now it’s still an entirely middlegame struggle. The kings still need defending. 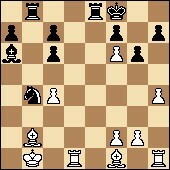 23. h5 The further you manage to push the pawn the easier life will be for the h1-rook. 23…Bc8 The saying “a stitch in time saves nine” applies here. The manoeuvre with the bishop via c8 was very strong three moves ago, but now it doesn’t promise a lot. The most obvious line leads to the perpetual checking of the white king. 24. hxg6 Yes, we’re heading for a draw. 25. Rxh7 There’s no alternative. 26…Nc2+ 27. Ka2 Nb4+ 28. Ka1 Perpetual check. DRAW. A game that was interesting, above all, as an opening experiment. It seems to me that the pawn sac that Carlsen played has the right to exist. The move order after the opening just needs to be honed a little. That’s a task for deep computer analysis… While in the game Aronian seized the initiative and got real winning chances. 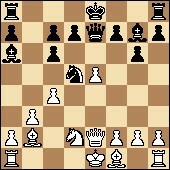 The decisive moment came on Black’s 20th move. Levon didn’t find the correct continuation of the attack – and let his winning chances slip. Well, it was a stormy opening, but everyone managed to survive. Working for you, dear friends, has been Grandmaster Sergey Shipov. I’ll be here again tomorrow for the second round. All the best!